The country star's trainer spills the secrets to her toned shoulders, core, and more. Remember that photo Carrie Underwood posted the other day? You know the one where she looks freaking amazing. O.K., thatâs pretty much every shot of her. Let me be more specific: the one where sheâs sporting an uber cute bikini and looking incredibly fit and fabulous. Yeah, that one. Well, theÂ pic inspired us (and others apparentlyâshe got 145k likes!) so much that we reached out to her trainer, Erin Oprea, author of The 4 x 4 Diet: 4 Key Foods, 4-Minute Workouts, Four Weeks to the Body You Want ($26; amazon.com). We begged Oprea to reveal the country star'sÂ exercise secrets. Here, she shares three of her favoriteÂ moves that she uses not onlyÂ when training Underwood, but with all her clients to help get them totally toned. âYouâll get a great burn in your booty and legs and thanks to the curtsy, youâll hit your side booty too,â says Oprea. Erinâs tip: If you don't have any dumbbells handy, use your body weight and add 5 more reps.
âThis will give you a great ab workout that you'll feel diagonally through your core,â explains Oprea. 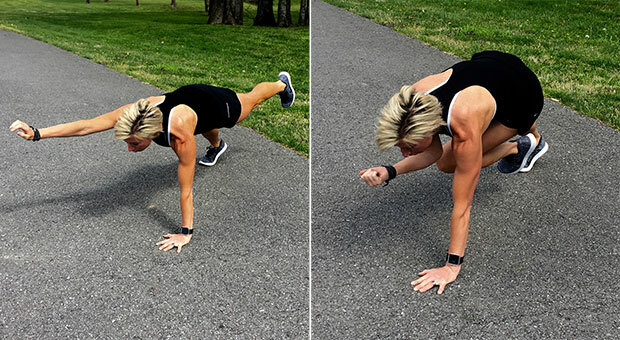 How to do it: Get into the up part of a pushup with feet wider than normal. Maintaining a flat back and keeping core engaged, extend right arm and left leg straight out, so that they are parallel with the floor. Bring right elbow and left leg in to meet, and then extend both back out. Do 8-12 reps, and then switch sides. Do 3 sets, 3 days a week. Erinâs tip: Do this move each time you finish a round of Squat into curtsy lunge. âThese really get you on your way to some killer shoulders,â notes Oprea. 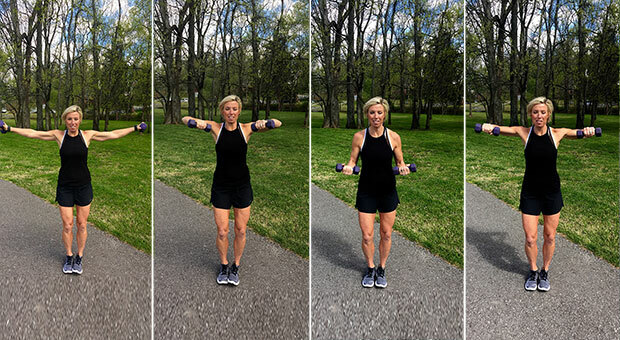 How to do it: Stand with feet together, a 3- to 8-pound dumbbell in each hand, and extend arms straight out to sides at shoulder height. Bend elbows, bringing hands in towards armpits, and then extend hands back out. Do 20 reps. Next, with weights in hands (palms face up) and elbows bent to 90 degrees, rotate shoulders forward until elbows are at shoulder height and palms are facedown. Do 20 reps. Do 3 sets of this combo 3 times a week. Erinâs tip: Go straight from the first set of moves right into the second move without stopping.